It’s been a long time since Indonesia-related post. Anyway, I make this for one submission for magazine entry with quite a long research eating snacks. Ehm. If Mexico has tortilla chip and the Japanese has senbei, I can proudly say that Indonesia has kerupuk. Kerupuk, or krupuk, is the way Indonesians call crackers. Indonesia has maybe the most varieties of cracker imaginable in the world. Simple snack and light in weight, do buy some kerupuk as souvenir if you go traveling to Indonesia. The big category of fried crackers usually called as kerupuk. 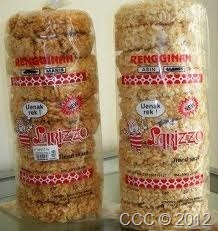 Actually kerupuk is the big-sized crackers, usually made from dried mixture of starch with ingredients. The most famous one is kerupuk udang (shrimp cracker), although you can find it with fish (kerupuk ikan). Indonesian kerupuk is a sight by itself, because the shape will change, from coin-size to notebook-size with deep-frying it. Other than the ingredients, such as intip (rice), kerupuk bawang (onion), kerupuk kulit or rambak (cow’s skin) and kerupuk jengkol (jering), the name of kerupuk can also differ from the shape, like kerupuk mie (noodle-shaped) and krupuk lempeng (flat shaped). There is also kerupuk tersanjung (flattered cracker), colourful, flower-shaped, cracker which got its name for a famous television soap opera. For you who don’t like deep-fried food, you can try kerupuk padang pasir/ melarat (desert krupuk/ poorman’s krupuk), cassava krupuk fried on sand from Kediri. Keripik is made not from batter, but from fried dried products. It can both be savory and sweet, and will be the most “snack-like”. It can be made from almost everything, from the sweet fruit keripik such as keripik apel (apple) from Malang, keripik salak (snakefruit), keripik nangka (jackfruit) or keripik semangka (watermelon) until the savory keripik sukun (breadfruit). It can also be made from tubers, the almighty keripik kentang (potato chip), keripik ubi (sweet potato), keripik talas (taro), until keripik belut (eel). Indonesia also has the usual banana chip. In Indonesia banana chip is eaten by itself, not being mixed with nuts. Either packed as plain, with cheese, spicy baladoor chocolate powder, this food is the primadonna of souvenirs from Lampung in southern Sumatra. Indonesia and soya beans mean tofu and tempeh. Both of them can be found in keripik form. Keripik tempe (tempeh cracker) is household favourite. Because of the magic of flavouring powder, you can get it in many flavours, including cheese, roasted chicken and even pizza. Rempeyek, is a savory brittle with salt-and-garlic flavoured flour and water batter as its binder. 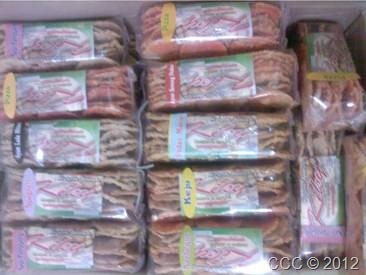 There are many kinds of rempeyek, from the vegetarian friendly peanut, soybean, or spinach rempeyek, the anchovy rempeyek and dried shrimp rempeyek, until the adventurer’s favourite, the termite rempeyek. Other than kerupuk, keripik, and rempeyek, there are still many kinds of Indonesian crackers. Emping is different food altogether. It is made from beaten flat melinjo’s seed (Gnetum gnemon). After sundried and deep-fried, it becomes tasty snack. 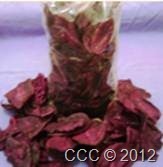 There are also emping made from corn (similar to corn chip) and tuber of Cyperus sp. Sundanese has its own opak as contribution in Indonesia’s krupuk universe. Rice flour mixed with flavouring, after being dried, it is grilled over hot coals. Rengginang is krupuk made from rice or sticky rice, dried, then deep-fried. Because it is not grinded, you still can see the shape of the grains in the cracker. Posted on April 3, 2012, in Culturing, Learning, Rambling and tagged indonesia, kerupuk, kripik, kropok, rempeyek, rengginang. Bookmark the permalink. Leave a comment.